They've got all the gear! Home > Pentax User Gallery > They've got all the gear! 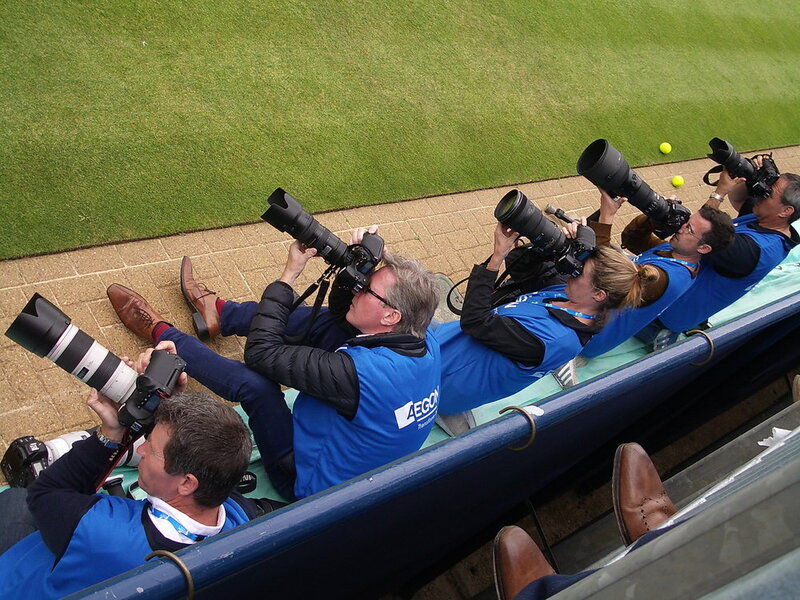 Taken at Queens Tennis Club Aegon Championships a new British 18 year old called Kyle Edmund making his first appearance on the senior tour - suddenly the cameras appeared! - I only had my small OptioS5! Nice. I do like the contrast between feet and photographers that really gives back right dimensions of the whole compo. Brilliant capture. Yes, the feet make a nice touch ! I'd like to have taken this. There's a lot to like about the composition. The more you look at it, the more you see. I like the nicely positioned two balls - for the less knowledgeable it tells us it's a tennis court. It's a pity that the head on the right is cropped, but that may have been to remove clutter - I think I might be tempted to cheat and do some cloning from the chap on the left! A super shot June, smashing compo. Thankyou Maria and Martin for your comments - yes I think your'e right we can't always see how funny we are as a group.